We love to hear from our customers! To ensure the best possible service, contact us using the email support form below. We will do our best to answer your question(s) within 24 hours. This contact method is available 24 hours a day. If you need help or have any other questions concerning your orders, please email us or call toll free 866.939.9545 from 9:00 AM - 5:00 PM pacific time Monday - Friday. Closed Saturday, Sunday, and most Holidays. Just like you, we are passionate about modern design! Come visit our showroom and discover the best in modern home furnishings. Our knowledgeable staff is available to show you the latest and best in interior design. We are ready to assist you with all your interior design- and contractual needs. From small residential projects to large commercial applications for hotels, restaurants, retail stores or corporations, Stardust has the experience to make your project a success. Our attractive showroom is located in the historic center of Sonoma, California. The Sonoma Wine Country is world famous for its exceptional wine and exquisite art galleries. This winning combination makes Sonoma an ideal place to visit, both for business and for pleasure. Our showroom features expansive street-side windows facing to the southwest which offer high visibility. Custom designed acrylite light boxes and high gloss mirror topped fiberglass display cubes show the best of everything on display. The 1000SF space we occupy is in a historic Art Deco (Art Moderne) building from the 1940â€™s featuring unique modernist touches, adding to the artistic appeal of the location. Yes, our building even has its own Gateway Arch similar like the one designed by Eero Saarinen (just a bit smaller). Our location is within an easy stroll of Whole Foods Market and within a two-minute walking distance of the historic downtown Plaza. From our prime location in this picturesque and affluent wine country, we are serving a market of 582,893 residents within a 20-mile radius. We have positioned our store as a showroom for our brands, while our website acts as a virtual extension of our store. Stardust has quickly grown to become the leading source in the modern home furnishings marketplace. We offer a unique assortment across a growing number of categories for both home and office including indoor- and outdoor furniture, modern lighting, contemporary rugs, home accessories and gift ideas. We have become the dominant authority on modern furniture and interior design and serve an ever growing number of home owners and trade customers who share our passion for high quality design. Stardust is the leading source for a growing number of trade customers, interior designers and architects. Our multi-channel infrastructure allows us to rapidly serve customers in any market both within the US and internationally. Whether you are creating a luxury boutique hotel in New York, an upscale apartment building in Miami or a ultra modern residential project in Brazil, Stardust can make it happen. 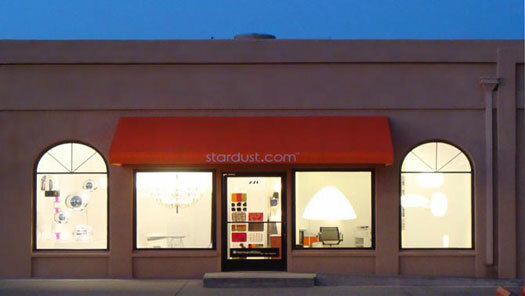 Buy modern lighting and contemporary home furnishings from Stardust. Simple and secure online shopping with excellent customer service, fast free delivery and guaranteed low pricing. We are the most influential lighting and furniture design store offering an outstanding selection of modern, designer and contemporary lamps, accent chairs, organizers, area rugs, home decor, outdoor furniture, garden pots and planters. Stardust Modern Design has everything you need to decorate your home in style. Whether you want to renovate your entire house, need a new pendant lamp above the dining room table or a desk lamp for the home office, we have some of the most amazing designs for every budget and space including living room, bedroom and bathroom. Visit our showroom or purchase online and experience the best in modern contemporary design for the home and office. Stardust modern furniture and lighting: authentic designer lighting and furniture by the world's leading designers and the best brands.